It’s that exciting time of year again! Baseball has started anew, and every fan base is hopeful of a strong season ahead for its favorite team. It’s also a time when many fans are wondering if one of their team’s pitchers is going to make it back from Tommy John surgery. For the past several years, I’ve kept track of as many Tommy John surgeries as I can in an online spreadsheet. This article serves as an analysis of that data from a number of different angles. By the end of the 2017 regular season, there were 183 pitchers who had thrown at least one pitch at the major league level and also had Tommy John surgery. In addition, 19 pitchers had undergone the surgery, did not enter any games in 2017, but finished the season on the major league disabled list. 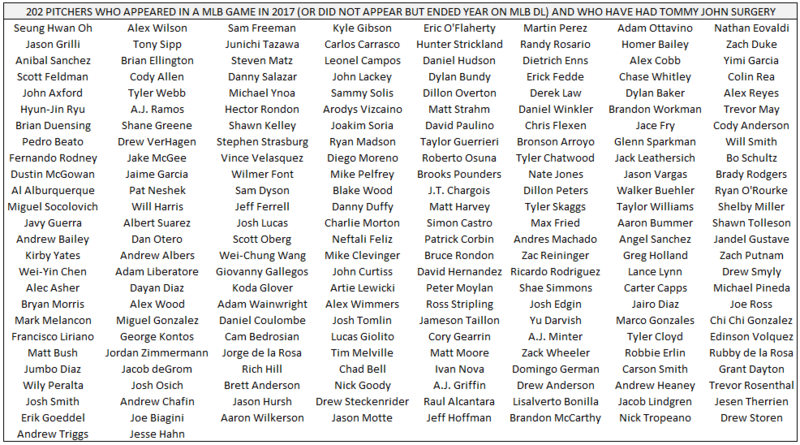 Here is the list of these 202 pitchers. The Dodgers, Giants and Tigers led the way, each using 10 pitchers who have had Tommy John surgery. The Orioles and Red Sox were at the other end of the spectrum, each using only two pitchers in 2017 who’ve undergone this procedure. In all, 26 percent of major league pitchers used in 2017 had undergone Tommy John surgery. In 2017, a whopping 86.7 percent of all regular season games featured at least one pitcher who has had Tommy John surgery. The breakdown of this percentage of games by team is shown in the table below. The 2017 game that involved the most pitchers who have recovered from Tommy John surgery was between the San Francisco Giants and Colorado Rockies on June 15. The pitchers combined to pitch 17 of the 18 innings. At five years, the Baltimore Orioles are the team with the longest active streak without losing a pitcher to Tommy John surgery. Here are the most recent surgeries for each team, for a pitcher whose last game prior to surgery was at the major league level. Tommy John surgery is prevalent enough that I commonly come across fans complaining specifically about their team’s bad luck or seemingly incompetent medical staff. In fact a few years ago, I was able to compile a set of tweets from fans — one for each major league organization — in which the authors weres lamenting how their team was especially hard hit with respect to Tommy John surgeries. For the most part, this is just a form of bias on the part of fans, who pay far more attention to their own club that any other. Even when there are a couple of surgeries close together on a single team, for the most part I believe this is merely coincidental. If I had to allow three fan bases the right to complain about the particular Tommy John hardship of their favorite team over a short period of time, it would be the fans of these teams. Nebraska has a fifth player with UCL damage within a year, but is still weighing whether to undergo surgery at this point. Concentrations this strong in a single place could still be just coincidental, but it certainly seems possible something about the training philosophy or implementation of that philosophy in these cases did not go as desired. Recently, I have been collecting data on certain Tommy John surgery rehabilitation milestones. Of course every athlete is different, and every surgery is at least slightly different from others. Having a player take longer to return than another should not be considered a failure. In some cases, two players who are ready to perform at the same level the same number of days after their surgery will still return to game action at substantially different times, merely because of the timing of the major league schedule relative to their readiness date. The following table shows the average times for players to achieve certain recovery milestones after the date of their Tommy John surgeries. I have included the standard deviation and the sample size, for completeness. All data collected for the table above were from Tommy John surgeries to professional players performed since 2007. There is a clear progression from beginning to throw again, to throwing off a mound, to a more formal bullpen session, to facing live hitters, to entering a game for the first time (often at a lower level as part of a rehab stint), to finally returning to pitch at the same level of baseball the player was playing in at the time of the surgery. It is not surprising that the standard deviation grows the farther along in the rehabilitation process the milestone represents, as there is more opportunity for a player to experience a setback or stall at a particular stage. The following table illustrates the typical return times depending on the level of the player at the time of the injury. Again all data used for this table was for Tommy John surgeries performed to pitchers only in 2007 or later. Note that the average return times for the lower levels of baseball are shorter than for the more advanced leagues. For players who are injured while performing in High-A ball or above, there are more opportunities to come back to play with a rehab assignment at a less advanced league before working back up to their previous level. I also track, where possible, the surgeon for each procedure. This is generally available for surgeries to major league players, but reported far less regularly for minor league players. The following table shows the number of Tommy John surgeries performed by surgeons to major league players since 2013, which was the first year after the late Dr. Lewis Yocum last performed surgeries. The table includes only surgeons who have performed more than one Tommy John surgery on major league players during this time span. Certainly Dr. Andrews is still the most prolific Tommy John surgeon for elite baseball players, but the table indicates that players are seeking out a wider variety of surgeons over the past few seasons. The percentage of major league Tommy John surgeries performed by Dr. Andrews over this five-year period appears to have been 65 percent, 53 percent, 40 percent, 39 percent and 22 percent. Since Tommy John himself returned to pitch in the majors in 1976, post-TJ pitchers have made at least 65,955 major league appearances for a total of at least 143,887 innings. That’s the equivalent of over three full seasons thrown only by pitchers who have recovered from the surgery. Here are the all-time leaders in major league appearances and innings pitched after Tommy John surgery. Position players have appeared in at least 27,825 major league games after ulnar collateral ligament reconstruction surgeries, accumulating 100,933 plate appearances. Here are the leaders for most games played and most plate appearances after the surgery. If Matt Holliday signs on for one more season, he could surpass Paul Molitor for the all-time lead in post-Tommy John surgery games played. With so many pitchers having Tommy John surgery over the years, have you wondered how much “dead” salary teams have paid while players are unable to play while rehabilitating from the procedure? I looked at major league player surgeries and pulled salary data from one of three sources (Lahman database, baseballchronology.com (now defunct), and spotrac.com). I noticed that these sources did not always agree on salaries for given players in given seasons, and without knowing which is the most reliable, assume all numbers should be considered good estimates, but estimates nonetheless. With this salary information, I calculated how much of each player’s salary corresponded to time away from the majors due to Tommy John surgery. To do this, I pro-rated the partial year lost based on the total number of months of a given season a player was post-surgery in the year of the Tommy John surgery, as well as the number of months in rehab prior to returning in the return season. For these purposes I considered only April-October. I included all full seasons lost in between the year of surgery and year of return. By doing this, I was able to get “dead” salary estimates for all but about 50 major league players who had Tommy John surgery. These remaining players either had the surgery pre-1985, when salary information is hard to track down, or were primarily on a minor league salary in the year they played a little in the majors and tore their UCLs. Of course teams may have insurance for some or all salaries. There may be additional costs or savings associated with having an injured player aside from a player salary number. A large number of minor league players have had this surgery, and despite their depressed salaries, organizations would incur a cost for those injuries as well. They are not included in this calculation. As of the end of the 2017 season I calculated an estimate of over $850 million in salary for major league players paid while they were unable to play due to Tommy John surgery and the subsequent recovery period. Roughly seven out of every eight MLB games you watched last year involved a pitcher whose career has been extended due to this surgery. More than a quarter of current major league pitchers have had it. While players have been recovering from having to undergo the procedure, my estimate is that it is approaching a billion dollars in sunk salary cost for organizations. For the past six years, I’ve recorded more than 100 Tommy John surgeries performed each year on professional players, and we know the numbers are far higher among amateur pitchers in college and high school. There is a reason the term “epidemic” gets used regularly when referring to Tommy John surgeries. Jon Roegele is a baseball analyst and writer for The Hardball Times. He was nominated for a SABR Analytics Conference Research Award in 2014 and 2015. Follow him on Twitter @MLBPlayerAnalys. Am I blind or is the top table, “Percentage of 2017 MLB Games Featuring at Least One Pitcher Who Has Had TJ Surgery”, missing Arizona? You’re not blind! Thanks for pointing this out. I don’t have that data on hand where I am during the day today, but I will update the table later in the day with the percentage for Arizona. On the table of most recent surgeries by team, you left out the Cardinals and Trevor Rosenthal, very ironic considering you opened with a picture of Rosenthal. Thanks for pointing that out! I added Rosenthal to the table. 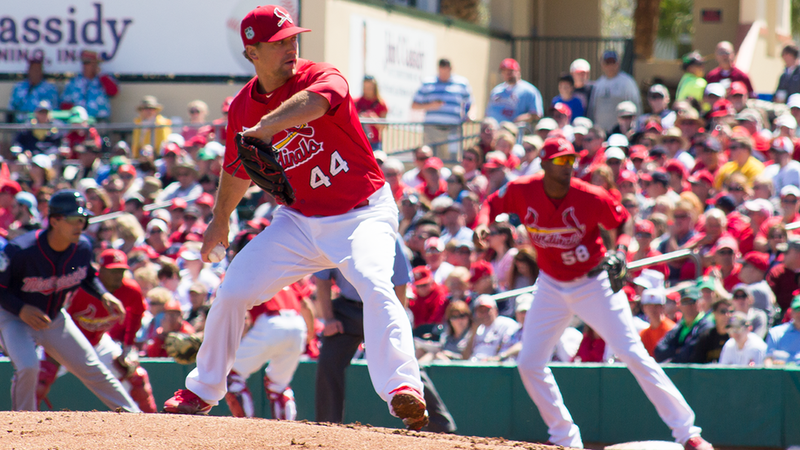 Perhaps it’s time to talk about the Tommy John Twist? Which is taught, not done naturally? I wonder if Japan, South Korea, Mexico, etc. have their own Tommy John surgery industries, or do players who need TJS come to the US? Or, is it just tough luck for TJS needing pitchers in foreign nations? Thanks for the question. Yes there are orthopedic surgeons in those countries as well that perform TJ surgery. Jeff Passan’s book ‘The Arm’ is a good read which touches on the same type of arm epidemic in Japanese baseball. I believe Brent Honeywell and Jose De Leon would have been more recent TJ surgery recipients (?) for the Tampa Bay Rays and not Shawn Tolleson back in 2017. Great article! Thank you! Do you have any suggestions for injury prevention (risk mitigation)?